With the school year rapidly approach, it has become that hard part of summer where it is time to focus on back to school shopping. I hate to see the summer end so quickly, but I absolutely love planning for the new year. Part of this planning includes making sure I have the right supplies to tackle the school year with my best foot forward. The most important item? Definitely my agenda. I have been using an agenda in school for as long as I can remember. Originally, I just wrote down my homework and upcoming assignments. Throughout high school, I began expanding the list of what was included in my agenda. From due dates to rehearsals to meetings, my entire day's to-do list could be found in planner. Honestly, I'm not sure I could have made it through high school without it! Finding the right agenda is truly a personal choice. I want to make sure there is plenty of room, a monthly outlook, and that it inspires me to get my work done. But, everyone has their own wants and needs when it comes to organization. Today, I've put together some of my favorite agendas that differ in layout and looks to fit a variety of personal tastes! I have used a Lilly agenda for the past three years. I love the layout. I can view the entire week at once and have found that the amount of room for each day is perfect for me. The prints, stickers, and detailing make me happy when looking at what I need to get done rather than stressed and overwhelmed. Plus with a variety of sizes and prints, there's a plethora of options to choose from. The Lauren James agenda worked great as my blog/content planning agenda for last year. It is lightweight and easy to fit in my bag. This year, Lauren James has redesigned their agenda to make it easy to track your health habits and monthly goals for career, health, family, love and fun. The pretty prints and pastel pinks help inspire me to get to work and turn my goals into accomplishments. The Kate Spade Agendas are the epitome of elegance. They are simplistic with pretty touches and styles to make them perfect for someone who needs an agenda but may not want anything too loud. The spiral binding is concealed making it that much easier to slip in and out of a bag. With gold foil stickers, weekly and monthly views, and a section for notes, this agenda is great for work and school. The Vineyard Vines agenda is a similar layout to the agendas listed above, but it is the planning section of this agenda that sets it apart. Vineyard Vines designated whole sections to dreams, goals, and trip planning. This agenda is perfect for someone who is always on-the-go and likes to think ahead! With fun prints and a lightweight style this agenda is great for in a purse, a backpack, or wherever your adventures may take you! The Day Designer is ideal for planning practically every moment of the day. With each day divided by the hour, it's easy to map an entire day and see how time is spent over the entire week. The monthly view also allows for clear deadlines to be set, meetings to be scheduled, and whatever may come up! Those who use a Day Designer love how detailed it can be, so if you're looking to plan your day specifically, this would be a perfect option for you! What kind if agenda will you be using this school year? 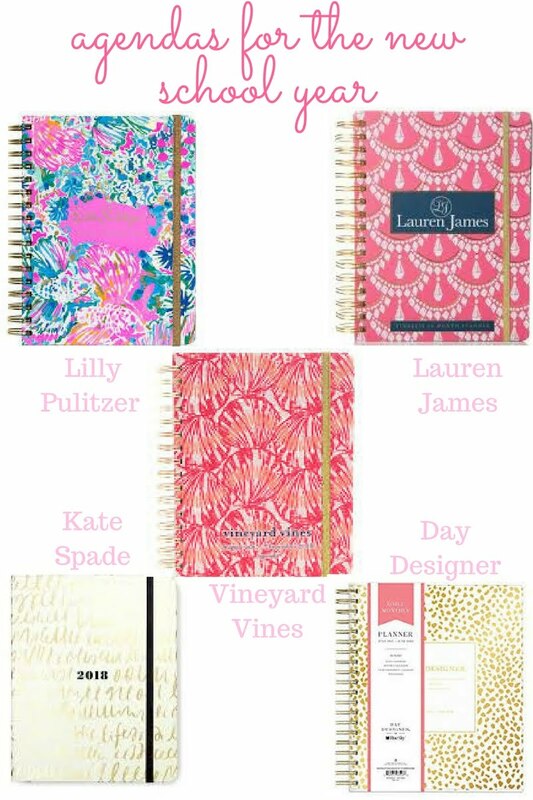 How did I not know that VV makes planners? My life has changed!! They're adorable!! I was so excited to see Vineyard Vines come up with agendas this year! They are all fun and perfect for school!